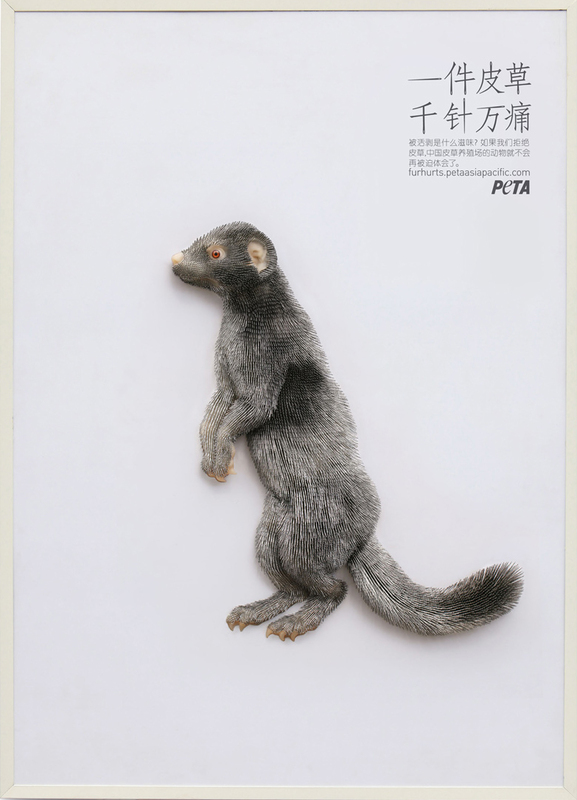 PETA’s “Fur Hurts” campaign in China recently won Gold for Public Service/Social Welfare, and Silver for Live Events – Beyond Advertising in the Non-Traditional section of the London International Awards. The campaign, launched in March 2013, was centred on life-like sculptures of marmosets, rabbits and foxes, their fur made of tiny needles. 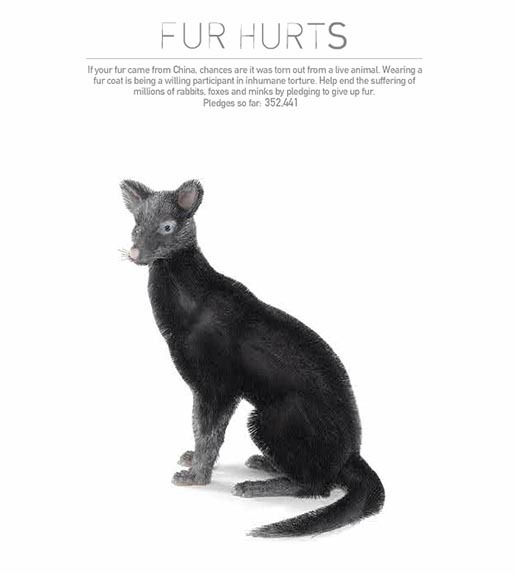 The sculptures, created by the Shenyang University Art Department, were placed on 3D billboards and in Zhuozhang Shopping Center in Shenyang, with information awareness information pointing to the campaign website, furhurts.petaasiapacific.com. 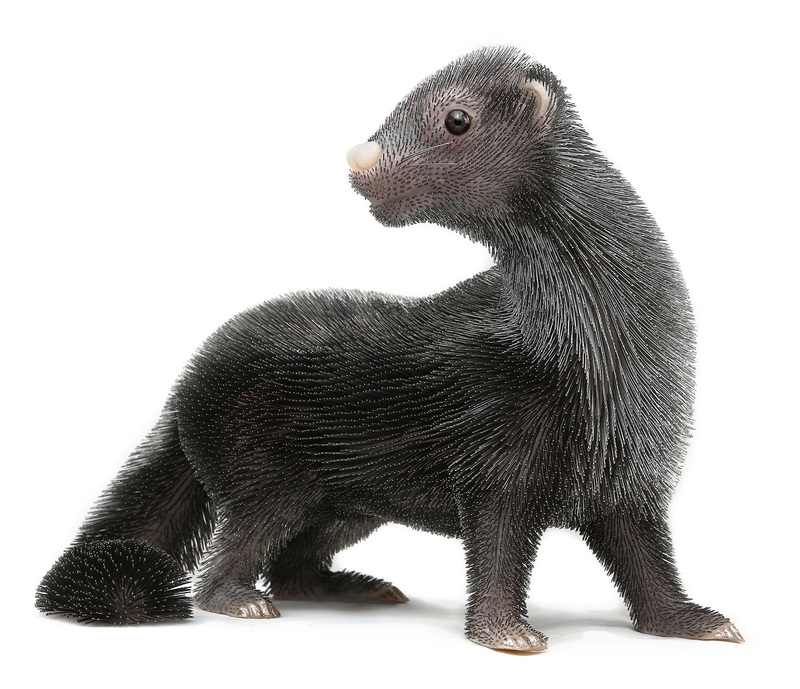 Visitors to the site who make a pledge to stop using fur, see a needle being replaced by a strand of fur. 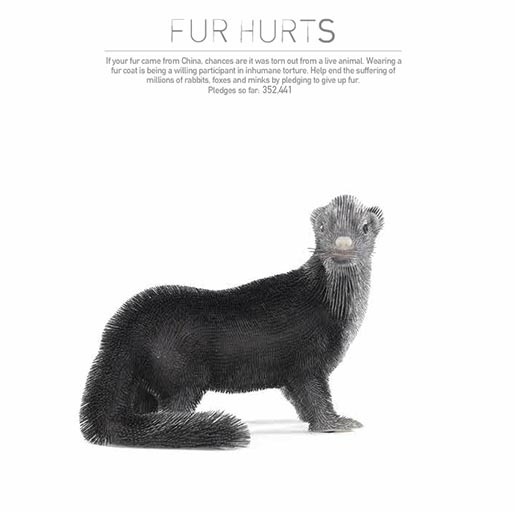 Fur coats and trim on jackets, shoes, and other accessories may look fashionable, but they’re the result of terrible pain says the animal rights organization, People for the Ethical Treatment of Animals. 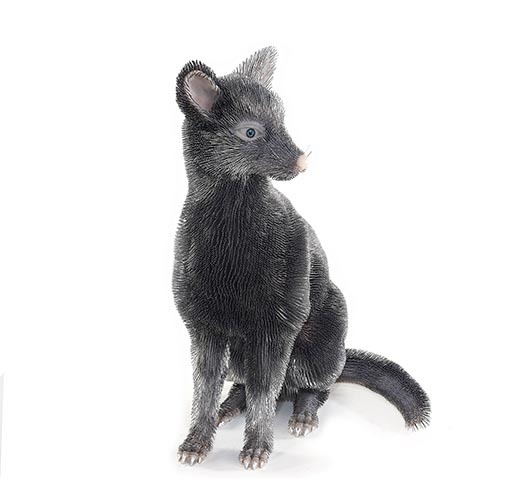 This is especially true in China, where sales of fur have increased over 22% in 2012 according to the China Leather Association and are expected to reach RMB16.42 billion (USD2.64 billion at the current exchange rate) over the next two years. 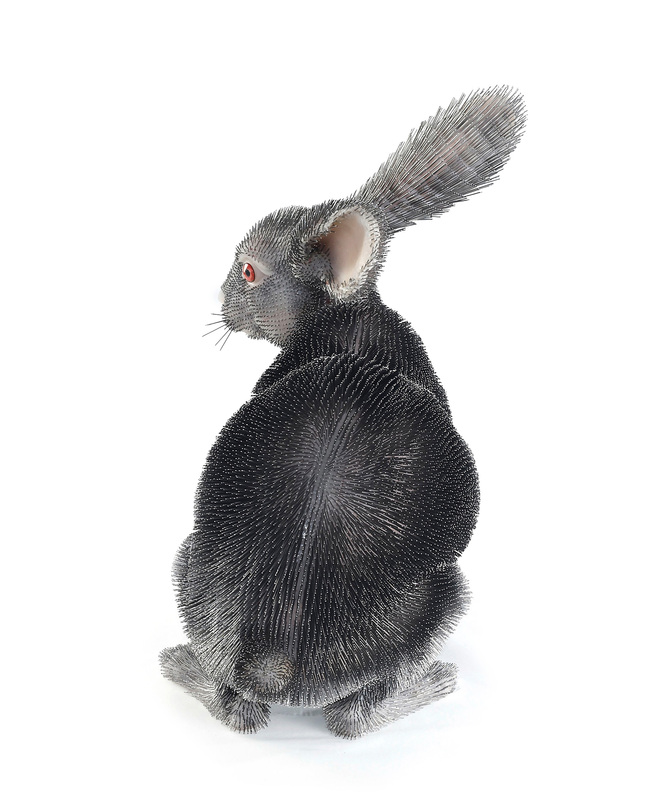 Yet this big business comes at a terrible price for the millions of animals needed to meet such demand, who are often kept and killed in inhumane conditions. 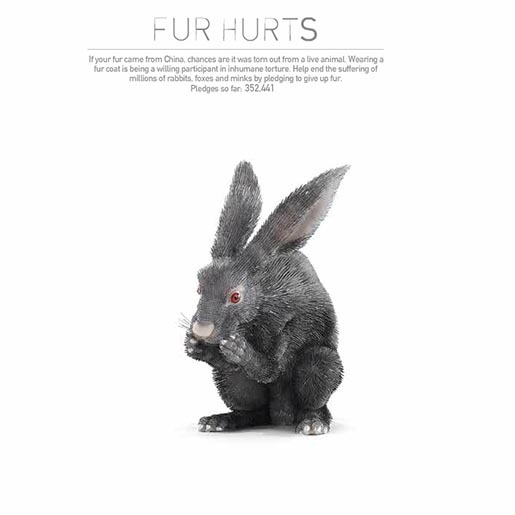 The Fur Hurts campaign was developed at Ogilvy China, Shanghai and Beijing, by chief creative officer Graham Fink, executive creative directors Juggi Ramakrishnan and Wilson Chow, creative director Xingsheng Qi, senior creative directors Morris Ku, Peggy Wang, art directors Ashley Chen, Hang Qi, senior copywriter KweiChee Lam, associate creative directors/copywritersPaul Bo and Awing Chen, associate creative director/art director Ming Law, business directors Uma Wang, Canna Jiao, head of digital Peony Wu, social marketing manager Olivia Fang, photographer Zhong Shi, account manager Freya Yan and senior account manager Iris Huang.